Barcode tracking is a proven and superior method for recording and tracking the movement of your evidence, assets, documents, personnel, and much more. You can manage just about anything—evidence, equipment, records, boxes, documents, people, and locations—using barcodes. Barcodes provide quick, keyless, and error-free retrieval and transfer capability to the user. They also enable our Document Imaging module to automatically index and store scanned documents. Our solution supports both attached and portable barcode scanners and PDAs to make data management more efficient and accurate. One of the major benefits of barcoding is the time saving and accuracy it provides the end user. For example, barcoding allows users to easily check items in or out, scan their status, or transfer them from one location to another. A location can be a place, such as the central file room; a person, such as a manager; or a box or shelf. Simply scan an item's or document's barcode and the system will automatically find and retrieve that item without you having to touch the keyboard. You don't have to put the software in a "scanning mode" or put focus on the barcode field. Just scan and view. Manage the physical location of all records, items, and even people by checking them in or out, scanning their status, or transferring them from one location to another. A location can be a place, such as the central file room; a person, such as a manager; or a box or shelf. You can provide improved service to both internal and external customers by being able to instantly locate, access, and deliver any and all items and associated documents. We include a flexible label design module right within the system. This module allows users to easily design labels for different purposes such as for evidence, assets, boxes, containers, people, shelf locations, and more. You have complete control over what’s on your labels, how they’re laid out, the label size, and other features. Designs can include barcodes, numbers, and text. Information is then auto-filled onto the label right from the application, which saves time and makes it easier to manage property and evidence. With the ability to find an item with simple barcode lookups, you can get what you need right away. And with the built-in inventory tools, you can quickly and easily perform an inventory when needed. Our system gives the user complete flexibility to design barcode labels. Any field or combination of fields from the system can be printed on the label. Easily designed within the system, you can save multiple formats for labels according to their purpose—for example. found property labels, general evidence, drug evidence, or gun labels. The Query by Scan feature allows multiple items that have no common factor to be scanned into a group for a common purpose. For example, suppose property needing release letters has been pulled from several locations. The items are scanned and assembled into a group. One click of the mouse produces the letters for each item in the group. 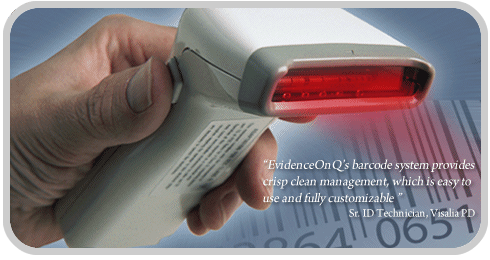 Query by Scan is a time-saving feature that is used daily in property rooms with the EvidenceOnQ system. Any information on your Profile (home) screen can be printed on your system's barcode labels. 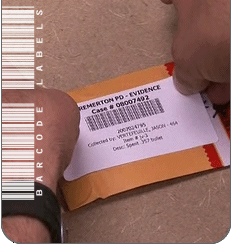 Printing the barcode labels for evidence can be done by the officer or the evidence personnel, depending on agency preference.